"The heir to the Lux series." Dreamland Teenage Fantasy. I've fallen hard for an alien, but he's harboring secrets. Massive ones that threaten the very essence of humanity. How can I give him my heart when his race plans on taking my future?Sadie Owens has been slowly dying inside. Bit by bit, piece by piece, day by day. Trapped in a life she hates, she relies on only one person--herself. Despised by her family and betrayed by an unscrupulous government, Sadie dreams of a different life. When she is chosen to participate in the government's new social experiment, she is ecstatic at the prospect of spending six months in Thalassic City, the shiny new city under the sea. Immediately drawn to Logan Chandler, Sadie is captivated by the beautiful boy with the ocean-blue eyes. Logan seems to embody everything that has been forbidden, but he isn't all he appears to be. Confused over Logan's true intentions and concerned when best friend Jenna starts transforming in front of her eyes, Sadie partners with newcomer Jarod in a bid to uncover the government's real agenda. The truth is more shocking than anything she could ever have imagined. When Sadie finally understands why the Saven walk among us, will it be too late to save her heart and the human race? Will I enjoy this book? 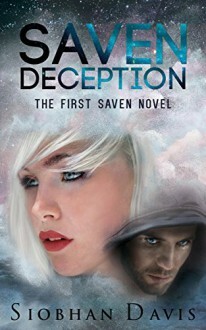 Saven Deception is Book 1 in a new exciting young adult science fiction fantasy romance series. This series will appeal to readers who love fast-paced plots with plenty of suspense and intrigue and tons of romantic moments. If you have read and enjoyed any of the following books/series then you will most likely love the Saven series: Kricket, Lux, Broken Skies, The Fifth Wave, Alienated, The Host, Gravity. Relevant genres: Teen and Young Adult, Science Fiction (soft), Dystopian, Romance, Fantasy, Urban Fantasy. PRAISE FOR SAVEN DECEPTION"The worldbuilding and characters leap off the page and come alive with flawless writing and a plot that had me engrossed and on the edge of my seat." Dali. TJ Loves to Read. "Gripping Read. From the start I was drawn into the world and felt like I was experiencing everything right next to Sadie." Patricia Hamill. Author-Blogger Pure Textuality. "This book had me hooked from the first chapter. An exhilarating ride with many twists and turns. Awesome." Karla. Goodreads Reviewer. "Siobhan Davis has created yet another world of characters I became very invested in. The premise is an intriguing one ... and it's different enough to stand out from other YA books." Deirdre. Goodreads Reviewer. "I am beyond excited for this series. Saven Deception was AMAZING and I couldn't put it down. Ms. Davis created an incredible world and I cannot wait to read the next installment." Michelle. Adventure in Bookland. "Saven Deception was a freaking awesome read! The worldbuilding was fantastic and the romance between Logan and Sadie felt amazingly perfect to me." Poulami, Daydreaming Books. "Another hidden gem from the treasure trove in Siobhan Davis' mind." Dianne. Tome Tender. "If you like Jennifer L. Armentrout's books then you'll love Saven Deception." Amazon UK Reviewer.BOOKS IN THIS SERIES Saven Deception - Book 1 Saven Disclosure - Book 2* Saven Denial - Novella 2.5* Saven Defiance - Book 3* *Coming 2016 Note from the Author: This series is written in US English. Recommended Reading Age: 15+I write books with lots of romance and if you only enjoy hard science fiction then this is not the book for you. While there is no major cliff hanger in this book it is not a stand-alone read. Thank you for taking the time to check out my work.